The company’s D*AP processors offer automated leveling of individual sources to pre-condition the audio before final loudness management. Jünger Audio is focusing its product development on providing customers with effective, high quality and automated audio production, particularly in live broadcast environments, and will show its latest innovations at the IBC 2016 convention. They call it “Smart Audio” and promote it as a way for broadcasters to ensure that viewers receive a consistent, clear audio experience by employing a chain of intelligent and adaptive real time processing algorithms that work together. The company said Smart Audio means investing in simple, reliable and predictable equipment that can automatically deliver audio content while maintaining the high quality that customers expect. The concept has already been adopted by a number of broadcasters, including Input Media in London and the ARD Tagesschau television prime time news service in Germany. 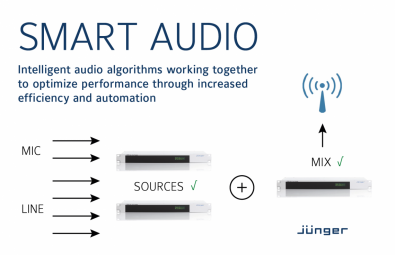 At IBC, Jünger Audio will be showing its full range of D*AP products that can deliver a Smart Audio experience because every device already incorporates a collection of these adaptive processing algorithms. They also employ the industry standard Ember+ remote protocol that allows seamless integration with an increasingly wide range of compatible equipment. D*AP processors offer automated leveling of individual sources to pre-condition the audio before final loudness based management. This is combined with auto up-mix to maintain a constant surround experience and the use of auto EQ to ensure consistency of spectral balance and speech intelligibility. They also incorporate Jünger Audio’s fully adaptive Level Magic loudness control that can adjust audio from any source, at any time, to the right level with no breathing, pumping, or distortion. Only a minimal number of initial parameters need to be set to make these processes work, according to Poers.